Why the Government still keeps the 400 buildings? I hope Abun Paulos will try to get back those buildings to our church. I THINK WE ARE SIMPLY TAKEN BY A CULTURE OF OPPOSING EVERY NEW MOVE. The notion that the church should continue to rent below a fair price is just unfair, WHILE THE CHURCH IN RURAL PART OF THE COUNTRY ARE HEAVILY UNDER RESOURCED. Look simple 1 room private home is just rented far over 200 birr in Addis now a days. Some of the list here is 15 bir, which is unfair. I am sure that it is renting some good room by this price. I THINK THIS IS A RIGHT MOVE BY THE HOLY SYNOD. I personally don't buy into the suggestion that this is against religious value. Asirat yemanawetaw aniso. Betekiristianin meziref yelemede tebayachin aleqen silale kalihone besiteqer. sorry, this what I want you watch. ወ/ሮ እጅጋየሁ (ኤልዛቤል) በኪራይ ጭማሪው ምን አሉ ተባለ??????????? I agree with you on the disorganized finance admin. Howevere, the move to increase the house rent on the church house is appropriate. 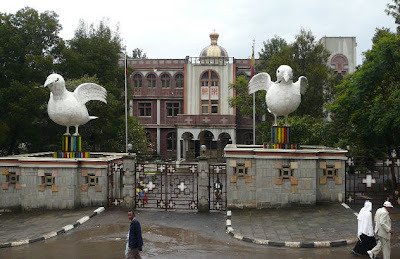 I know some pople who live in the church house by 200 and they rent their house in bole, geregi, etc more than 15,000. Most of the pople in Artkilo bulding are the rich pople with having more than two house. So pls let us think before commenting. In other side, the church adminstration should take care for vulnurable pople( our church is ye dehoch metgiya). is the sister of Abba Paulos also included in the rent adjustement. I know persons leaving in Betekinhet Building in Arat Kilo earning a salary of Birr 15,000, while renting their house which they built while living here for Birr 10,000. Some have already the apartment for office use increased rents are not by no means comparable to the market price which I suppose is above Birr 4,000. The church has be considerate. Let us be reasonable, a monthly rent of Birr 200 is not sufficient to cover maintenance and administrative costs. Let us not be the mouth of people who want to gain unnecessary privileges from the Church. In the Name of the Father, the Son, the Holy Sprit One God Amen! I know persons leaving in Betekinhet Building in Arat Kilo earning a salary of Birr 15,000, while renting their house which they built while living here for Birr 10,000. Some have already rented the apartment for office use. The increased rents are not by no means comparable to the market price which I suppose is above Birr 4,000. The church has be considerate. Let us be reasonable, a monthly rent of Birr 200 is not sufficient to cover maintenance and administrative costs. I believe this is one way to clear all the wrong doings in our church. lets live with the truth. people who rent 200 per month will rent it for second hand renter by 2000 birr a month, which make them earn 1800 birr net income a month.this is true every body knows who live in addis. so this is the right decision. when we see the percentage 500% increament it is not a wonder (0.75 to birr 15) is more than a fair. when the owner looses the renter gains. i said very good job. No body has to make any profit on the name or property of our church. "ሁኔታው በተለይ ለትርፍ ባልተቋቋመች ቤተክርስቲያን መፈፀሙ አሳዝኖናል" this is a cover to make them selves free of the despute. yes the church is not working for profit, BUT it doesn't have any source from Soudi, Europoe or America to support its monastries. SO the churrch has the right to use its properties properly. see this comment: አንዳንድ ተከራዮች ሁለት መቶ ብር የተከራዩትን ቤት ከሁለት ሺህ ብር በላይ አከራይተው ሌላ ቤት ተከራይተው እንደሚኖሩ ያስታወሱት አቡነ ይስሐቅ "እኛ ግን ይህን ያህል የተጋነነ ጭማሪ አላደረግንም". we know people are selling the key for thousands of birr too.